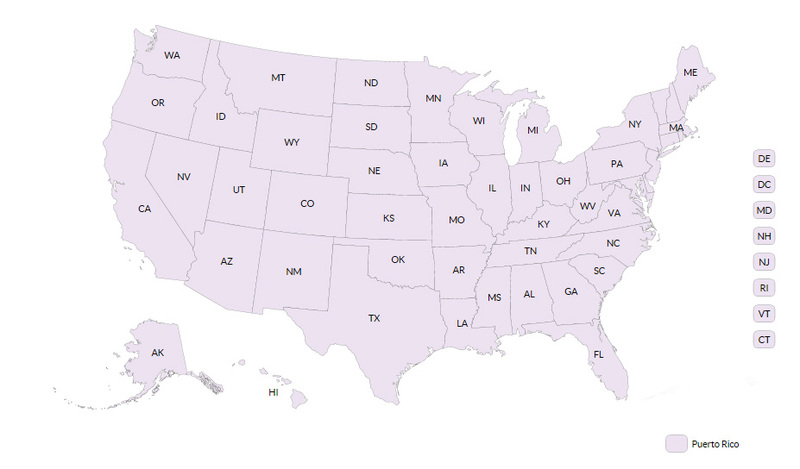 This tab shows what percentage of all reporting fertility clinics in the U.S. performed certain services, held membership with SART, or used an accredited embryo laboratory in 2016. This tab also displays a national summary of all ART cycles started in 2016 and the outcomes of these cycles. Multiple-infant births (e.g. twins, triplets, or more) with at least one live infant are counted as one live birth delivery. Select a state to find a list of clinics for that state. Patient characteristics data summarize the kinds of patients who received ART procedures. Please note patient characteristics are presented per cycle rather than per patient. As a result, patients who had more than one ART cycle within the reporting year are represented more than once. Because a woman's fertility declines with age, ART data are reported separately by age group. You may wish to find a clinic that commonly sees patients your age. What are the ages of patients using ART? National information based on 196,803 ART cycles in 2016. View different clinic success rates by age of the woman, as well as optionally by cycle type, number of embryos transferred, and diagnosis or embryo stage at transfer. An important goal of fertility treatment is the birth of a single, term, normal birth weight infant. Displayed below are the percentages of all ART cycles started that resulted in the birth of a full-term single live infant with normal birth weight. Births are defined as term if at least 37 full weeks gestation and normal weight if at least 2,500 grams. What is the chance of having a term, normal birth weight and singleton live birth per ART cycle? National information based on 86,237 ART cycles in 2016. National information based on 86,266 ART cycles in 2016. National information based on 24,300 ART cycles in 2016. • HHS Office on Women's Health . • Society for Assisted Reproductive Technology (SART) . • American Society for Reproductive Medicine (ASRM) . • Resolve . • Path 2 Parenthood. ART for single women ART for single women is when ART treatment is performed for women who report that they are unmarried. Donor egg services A donor egg cycle occurs when an embryo is formed from the egg of one woman (the donor) and is transferred to another woman (the recipient). Donor embryo services A donor embryo is an embryo that is donated by a patient or couple who previously underwent ART treatment and had extra embryos available. Gestational carrier services A gestational carrier is a woman who gestates, or carries, an embryo that was formed from the egg of another woman. The gestational carrier usually has a contractual obligation to return the infant to its intended parents. SART member The Society of Assisted Reproductive Technology (SART) is an affiliate of the American Society for Reproductive Medicine (ASRM) and is a professional society composed of clinics and programs that provide ART. Verified lab accreditation Clinics with a verified lab accreditation use an embryo laboratory accredited by one or more of three specific accrediting organizations: College of American Pathologists, The Joint Commission, or the New York State Tissue Bank Program (NYSTB). To become certified, laboratories must have in place systems and processes that comply with the accrediting organization’s standards. Depending on the organization, standards may include those for personnel, quality control and quality assurance, specimen tracking, results reporting, and the performance of technical procedures. No filter No filter is applied. Tubal factor Tubal factor infertility is a diagnostic category used when the woman’s fallopian tubes are blocked or damaged, making it difficult for the egg to be fertilized or for an embryo to travel to the uterus. Uterine factor Uterine factor infertility is a structural or functional disorder of the uterus that results in reduced fertility. Ovulatory dysfunction Ovulatory dysfunction is a diagnostic category used when a woman’s ovaries are not producing eggs normally. It includes polycystic ovary syndrome and multiple ovarian cysts. Diminished ovarian reserve Diminished ovarian reserve means that the ability of the ovary to produce eggs is reduced. Reasons include congenital, medical, or surgical causes or advanced age. Endometriosis Endometriosis is a medical condition that involves the presence of tissue similar to the uterine lining in abnormal locations. This condition can affect both fertilization of the egg and embryo implantation. Male factor Male factor infertility refers to any cause of infertility due to low sperm count or problems with sperm function that makes it difficult for a sperm to fertilize an egg under normal conditions. Other factor Other causes of infertility include immunological problems, chromosomal abnormalities, cancer chemotherapy, and serious illnesses. Unknown factor Unknown cause of infertility is a diagnostic category used when no cause of infertility is found in either the woman or the man. Multiple female factors only Multiple female factor infertility is a diagnostic category used when more than one female cause of infertility but no male factor infertility is diagnosed. Multiple female & male factors Multiple female and male factor infertility is a diagnostic category used when one or more female and male causes of infertility are diagnosed. Cleavage stage transfer A cleavage stage transfer occurs when an embryo is transferred after being cultured in a laboratory for 2 to 3 days after insemination. Blastocyst stage transfer A blastocyst stage transfer occurs when an embryo is transferred after being cultured in a laboratory for 5 to 6 days after insemination. One embryo transferred Placement of a single embryo into a woman’s uterus through the cervix after IVF: in ZIFT, zygotes are placed in a woman’s fallopian tube. Two embryos transferred Placement of two embryos into a woman’s uterus through the cervix after IVF: in ZIFT, zygotes are placed in a woman’s fallopian tube. More than two embryos transferred Placement of three or more embryos into a woman’s uterus through the cervix after IVF: in ZIFT, zygotes are placed in a woman’s fallopian tube. Fresh embryos from nondonor eggs Fresh non-donor ART cycles are those cycles that were performed using a woman's own eggs or embryos that have not been frozen. Frozen embryos from nondonor eggs Frozen non-donor ART cycles are those cycles in which a woman's own frozen embryos are thawed and transferred to the woman. Fresh or Frozen embryos from donor eggs Donor ART cycles are those cycles performed using a donor egg or embryo.